Fantastic interior page by the legendary British artist Geoff Campion, who was IPC's foremost artist in the 1960s. This is from RoBusters ( the forerunner to ABC Warriors in 2000ad! ) 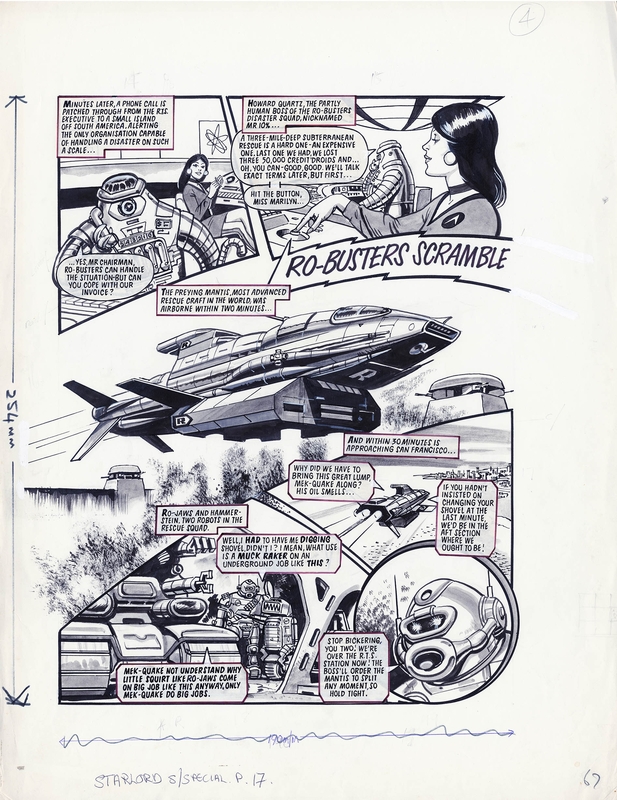 featuring Hammerstein and RoJaws, Mek Quake, and Howard Quartz, and was published in July 1978 in the STARLORD Summer Special. STARLORD only ran fromMay - Oct 1978 for 22 issues, and this one special. STARLORD had a slightly higher budget and printing quality, so most art was done in B&W with a tonal wash (Like this strip). A rare chance to own an early piece of Starlord / 2000ad history! Page is 38 x 51 cm in good conditions.